Sarah Diana Stevenson MBE is a British Taekwondo athlete from Bentley, Doncaster. She attended the Don Valley High School in Scawthorpe, and she started training Taekwondo at the age of 7. She later trained at Sportcity in Manchester and remains an active member of the Allstars Taekwondo Academy in Doncaster coached by Master Gary Sykes. Stevenson finished fourth on her Olympics debut in 2000 and after a judging error was reversed in the quarter-finals of the 2008 Olympics in Beijing, she went on to win a Bronze medal, the first British medalist at the Olympics in this sport. She took silver at the Olympic qualifiers despite suffering a broken hand. 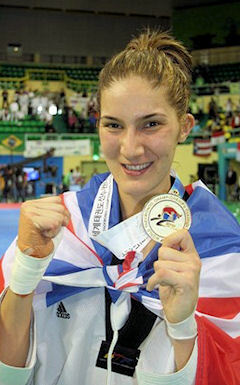 She became the first British Taekwondo World champion.